Globalization and the rising threat of terrorism are just two of the many issues challenging border agencies’ ability to secure the swift movement of people and goods across borders. At the same time, emerging technologies such as the Internet of Things (IoT,, blockchain, biometrics, data analytics and machine learning have introduced new risks and opportunities, requiring a rapid and innovative response from industry leaders. 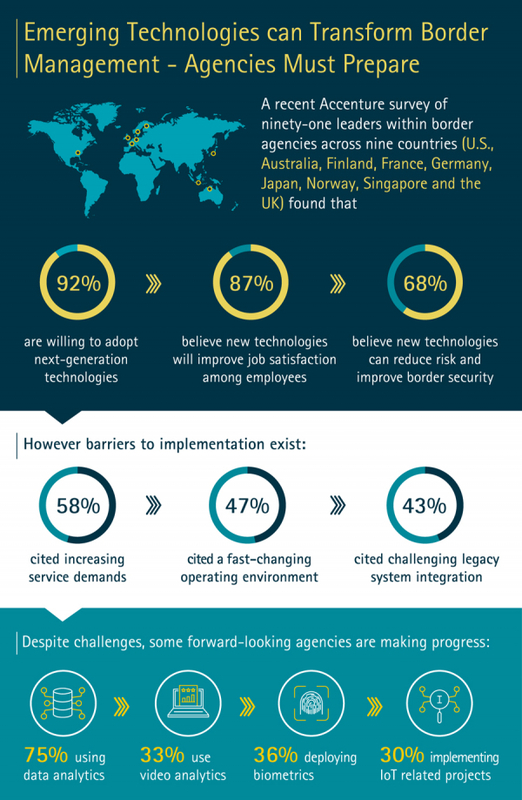 A recent Accenture survey of 91 leaders within border agencies across nine countries – Australia, Finland, France, Germany, Japan, Norway, Singapore, the United Kingdom, and the United States – found that despite challenges, the majority (92%) are willing to adopt next-generation technologies. In fact, most believe that these technologies can help reduce risk and improve border security (68%), while enhancing customer service delivery (54%). Despite this near consensus, many agencies have not yet deployed these technologies due to significant implementation obstacles. In the coming years, emerging technologies will fundamentally change border management, creating huge opportunities for industry transformation. While some agencies, such as Singapore Customs, have taken steps to deploy these technologies, most are struggling to keep up with the pace of innovation. Respondents cited increasing service demands (58%), a fast-changing operating environment (47%), challenging legacy system integration (43%), and an aging workforce (41%) as the four biggest challenges facing border agency leaders today, all acting as barriers to digital transformation. However, some agencies are embracing more familiar technologies, especially those that will help them achieve their data management and operational objectives. For example, the research found that three-quarters are utilizing advanced analytics and predictive modelling techniques to re-engineer travel and Customs processes, thereby improving overall business performance. The most commonly cited reason for implementing advanced analytics was to improve and augment the work of employees (48%). Surprisingly, cost reduction was not a key motivation for survey respondents, only 15% of whom said they had budgetary concerns. Despite the relatively high adoption of data analytics solutions, respondents reported limited use of video analytics, with less than a third saying they were piloting the technology – in spite of the clear benefits that video analytics capabilities bring to the management of ports and border crossings. Adoption of biometric-based solutions was also surprisingly low. Only 36% of survey respondents are using this technology, despite the availability of mobile devices to capture the biometric details (fingerprints, facial image, etc.) of travellers at border points or when they apply for visas. And, while two-thirds of respondents were familiar with the IoT, less than one third were piloting or implementing IoT-related projects. Despite these low adoption rates, there are pockets of innovation – the use of smart containers, embedded sensors, and tracking technology by some border agencies. This is most notable in the freight industry with its use of smart containers embedded with sensors and tracking technology such as GPS and RFID chips, allowing manufacturers, carriers, and shippers to monitor the temperature, vibration, losses and location of their cargo more accurately. The deployment of next-generation technologies demands significant operational changes for border agencies, but forward-looking agencies are taking steps in the right direction. A majority of survey respondents said that they have adapted their work processes (88%) and organizational models (68%) to accommodate technology adoption. The Finnish Immigration Service (MIGRI) is one agency taking steps to drive the adoption of new technologies through its Smart Digital Agency programme, designed to enable the digital transformation of MIGRI’s operations. Through a series of pilots, the initiative will examine the potential impact of emerging technologies, such as analytics, artificial intelligence, machine learning, robotics, and intelligent processing services. The survey also revealed that most Customs and border agencies (87%) believe that new technologies will improve job satisfaction among employees by allowing them to focus on more specialized, higher level tasks. Over half of respondents said their organization currently possessed the necessary skills to drive change, including data scientists (52%) and Research and Development (R&D) staff (54%). A similar percentage reported that they are currently looking to hire new digital developers and designers. Another factor impacting the deployment of new technologies is a lack of industry role models. Most survey respondents (89%) said that they study successful implementations from the private sector, while only one-fifth (20%) look to their public sector peers for best practices. Collaborating with universities, research institutes, and forward-thinking companies can help border agencies to identify and actualize innovative solutions to operational challenges. Interestingly, more than two-thirds of respondents said that they are willing to embrace public-private partnerships and new commercial models (69%), and to consider “as-a-service” models for technology deployments (70%). A similar proportion say that they have already teamed with the private sector to help meet increasing service demands (73%). Education and collaboration are crucial for helping border agencies to harness the transformational potential of intelligent technologies. The private sector and academia should keep their public sector peers informed about emerging technologies, sharing best practices and lessons learnt from their deployments. Fortunately, the vast majority of border agency leaders (92%) support the deployment of intelligent technologies. This innovation mindset is key to the safe, secure and efficient passage of people and goods across borders, as well as an economic imperative and key driver of national and global prosperity for all countries.